NEXT Sunday's clash between Galway and Limerick in Salthill will serve as a straight promotion shoot-out after the All-Ireland champions maintained their 100 per cent record in this year's 1B with victory in Parnell Park today while Limerick won in Belfast. 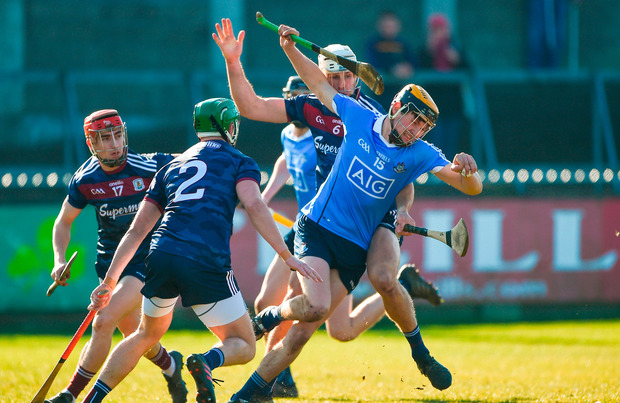 Micheal Donoghue's team won by six in an attritional battle, with Dublin getting to within two at one stage in the second half. They also missed a penalty when Paul Winters' shot was saved by James Skehill. But 1-9 from Jason Flynn, including 1-3 from play, was vital for Galway, while Cathal Mannion also contributed 0-4 from wing-forward. Galway dominated the first half and led by nine points at one stage although a 33rd minute Danny Sutcliffe goal gave the half-time scoreboard a more sympathetic look than Dublin strictly deserved. Dublin packed plenty of fight but their hurling mostly inferior. Galway meanwhile, had excellent displays from both Pádraic and Cathal Mannion, Flynn and midfield prospect Seán Loftus. Paul Winters pitched in with nine points from placed balls but his 46th minute penalty was well saved by Skehill. In the 53rd minute, Dublin had clawed it back to two but Flynn scored a brilliant 1-1 with his next two balls to force the home side to chase the game from there on in. Late scores from Niall Burke and Cathal Mannion ensured Galway’s promotion clash next week in Salthill. Dublin's scenario is also straight-forward now. Offaly's victory over Laois in Tullamore earlier today ensured that a victory in Portlaoise next Sunday against the latter will put them into a League quarter-final and in doing so, avoid the ignominy of a relegation play-off to Division 2A. SCORERS – Galway: J Flynn 1-9 (0-6f), C Mannion 0-3, P Mannion, S Loftus, N Burke 0-2 each, B Concannon 0-1. Dublin: P Winters 0-9 (8f, 1 ’65), D Sutcliffe 1-1, T Connolly, F Mac Gib, R Hayes, C Boland 0-1 each.